Our instructors are experts in diversity and equity. The following instructors teach our workshops. Lucille B. (Luci) Bearon, Ph.D., associate professor and adult development/aging specialist, is a sociologist with 40 years in the field of gerontology. She earned her doctorate from Duke University in conjunction with the Center for the Study of Aging and Human Development. She joined the faculty at NC State in 1995 to provide support to the counties on issues related to older adults and their families. Her focus areas are successful and healthy aging, family caregiving for older adults and grandparents raising grandchildren. She teaches graduate courses on gerontology, family life education and family relationships for the Master’s degree program in Family Life and Youth Development. She represents NC Cooperative Extension on the Governor’s Advisory Council on Aging, has been an expert panelist for the Rosalynn Carter Institute of Caregiving and is a Fellow of the Association for Gerontology in Higher Education. member of TTA Advisory Board, Raleigh Parks and Recreation Advisory Board. Jill Blitstein is the international employment manager at NC State and has over 18 years of immigration experience. Her current position involves assisting departments, faculty and staff with employment-based immigration and visa issues and overseeing the employment eligibility verification process and compliance procedures at NC State. Jill earned her law degree from DePaul University College of Law in 1995 and is licensed to practice law in Illinois. Prior to joining NC State, she was an associate/senior associate at the Chicago office of Fragomen, Del Rey, Bernsen & Loewy, a global immigration law firm, from 1997 to 2007. She has provided training to HR and legal professionals on various immigration topics, including non-immigrant classifications, permanent residence, visa and travel issues and employment eligibility verification and compliance. 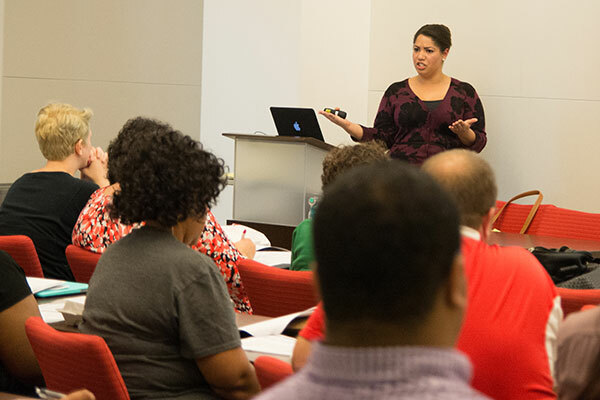 Jill was a co-planner and speaker at the Foreign National Taxation and Immigration Compliance Conference, which was hosted annually by NC State University and the NC Office of the State Controller from 2012-2014. In May 2013, and again in February 2015, Jill testified on Capitol Hill before a House Judiciary Subcommittee on E-Verify. Jill has been a member of the American Immigration Lawyers Association (AILA) since 1998 and the College and University Professional Association for Human Resources (CUPA-HR) since 2013. Willa J. Casstevens, MSW, LCSW, Ph.D. is an associate professor at NC State. Professional experiences include fifteen years in the community mental health arena. Her primary area of interest is mental health, with a focus on alternative treatments, advocacy and prevention. Many of her publications focus on mental health practice and symptoms framed around theoretical approaches that include cognitive, post-modern and critical perspectives. Current research involves suicide prevention on campus and psychiatric clubhouse model programs. Tom Colclough began his career with the EEOC in 1988. In 1989, he became an investigator. In 1998, he was promoted to the position of enforcement supervisor. In February 2005, he became the director of the Greensboro local office. In October 2006, he was promoted to the position of area director in the Raleigh area office. As director of the Raleigh area office, Mr. Colclough provides guidance and direction to support the EEOC’s national and local enforcement plans. His office model ensures that employees focus on the Commission’s top priorities, and he works to motivate all employees to work together on common goals. Colclough also works closely with the district director and other management staff within the Charlotte district. Colclough graduated from Saint Augustine’s College with a Bachelor of Science degree in business administration. He also served in the military (active and reserve) for 23 years and retired from the North Carolina National Guard in 2005 at the rank of Lieutenant Colonel. Adrienne Davis is a graduate of Bethune-Cookman University in Daytona Beach, Florida, where she earned a bachelor’s degree in English. She also earned a master’s in public administration at the University of North Carolina at Chapel Hill. She later served under the leadership of Julius L. Chambers as the director of research, student programs, and community services at the UNC Center for Civil Rights. Deeply committed to interrogating the intersections of equity, inclusion and diversity, Davis says that she loves inviting people into restorative conversations that build healthy communities. She has worked at the Trinity School of Durham and Chapel Hill in Durham, North Carolina, where she served as its first diversity coordinator. In her current role, she provides technical and case management support for the university’s Bias Impact Response Team (BIRT), coordinates ongoing training for BIRT members and develops restorative practices designed to build community and support impacted persons following acts of discrimination, injustice and bias. She also assists with departmental strategic planning, assessment, marketing/communication and fund development for the campus community centers. A New Jersey native, Della Fave earned his Bachelor of Arts degree in film production from New York University, and then went on for his Master of Arts and Ph.D. in sociology of Fordham University and Virginia Tech. He has spent the last 36 years of a 42-year academic career at NC State. In his time here. he has taught courses on race and class inequality in addition to sociological theory at both graduate and undergraduate levels. He has published numerous articles in sociological journals and is the author of the book Race and Revolution. In his teaching and writing, he has focused not only on the injustices resulting from inequality but has also explored alternative forms of social organization designed to eradicate those inequalities. In 2001, he was named Alumni Distinguished Undergraduate Professor. Upon his retirement in 2011, he was named Professor Emeritus of Sociology at NC State. Jeff Dillman is the co-director of the Fair Housing Project at Legal Aid of North Carolina. From 2005-2011, he was the executive director of the Housing Research and Advocacy Center, a non-profit fair housing organization in Cleveland, Ohio. Previously, he was an associate professor at Case Western Reserve University School of Law, where he taught and supervised students in the civil and immigration law clinics from 2002 to 2005. He has also taught in the clinical program at the University of Dayton School of Law and was a supervising attorney for the Asylum and Refugee Law Project at the University of Michigan School of Law. For six years, Mr. Dillman was in private practice in Michigan, with a practice focusing on prison civil rights litigation. He is licensed to practice law in North Carolina. Versatile… intense… exciting… innovative… and dynamic are the terms used to describe Tia Marie Doxey. Ms. Doxey is a graduate of West Virginia University with a Bachelor’s in music. She also received a Master’s in education with an emphasis in higher education from NC State. With more than twelve years of higher education administration experience, Ms. Doxey has worked at Old Dominion University, University of Tennessee at Knoxville and NC State. Also an actor and singer, she has performed in several operas and portrayed Mama Lena in “Raisin in the Sun” at NC State. Committed to educating others about cross-cultural communication, diversity, white privilege and coalition building, Ms. Doxey shares her inspirational and entertaining messages with associations, conferences, corporations, schools and churches. She is currently director of Student Life Assessment at NC Central University and the campus affiliate director for the NC Central affiliate of the National Coalition Building Institute (NCBI). Daniel Hackley is the veterans educational benefits certifying official in the office of Registration and Records. Through this role, he supports over 700 students in the processing of Veteran Affairs education benefits. Daniel previously worked with the North Carolina Department of Military and Veterans Affairs as a public relations specialist, assisting with the development of the NC4VETS initiative. He is originally from Stockton, California and moved to North Carolina in 2011 after serving six years in the United States Army as an aviation Power Plant Technician. During his enlistment, Daniel spent 24 months deployed to Afghanistan with the 101st Airborne (AASLT) Division in 2008 and was stationed at Camp Humphreys, South Korea in 2006. Daniel earned a B.A. in communication from NC State. Jodi Hall, MSW, Ed.D., is an assistant professor at NC State. Professional experiences include child welfare, public health social work and human services staff development. Her areas of interest include health disparities, older adults and field education. Her research is framed around critical race theory and social justice. Publications focus on disparities in health and education and older adults. She is the Director of MSW Field Education in the Department of Social Work. Elizabeth James is the director of the Office of International Services. Elizabeth has a Master’s degree in higher education and student affairs from Indiana University at Bloomington and a law degree from the University of North Carolina at Chapel Hill. Elizabeth has over 10 years of experience in working with international students and scholars at the University of Evansville, Indiana University, the University of South Carolina and the University of North Carolina at Chapel Hill in addition to having studied abroad in England, Spain and Scotland. Prior to joining NC State, Elizabeth was an associate at Ogletree, Deakins, Nash, Smoak and Stewart, a national labor and employment firm where she practiced immigration law. Elizabeth has extensive experience in presenting on issues impacting international students, scholars and employees and is an active member of NAFSA Association of International Educators and the American Immigration Lawyers Association. Beverly Jones Williams, director of outreach and education in the Office for Institutional Equity and Diversity, has worked at NC State for many years in various positions. In her first position in University Housing, she lived on campus and worked directly with students. In 1988, she left NC State to take a position as area coordinator at the University of Tennessee, Knoxville. She later returned to NC State as assistant director in University Housing. After working in housing, Ms. Williams made a shift into training as a training and development specialist in Human Resources. In 2000, she moved to the Office for Equal Opportunity (now the Office for Institutional Equity and Diversity), where she directs the Equal Opportunity Institute and NCBI. Carley Wyche is an assistant equal opportunity officer at NC State. Originally from Tallahassee, Florida, Carley Wyche received her undergraduate degree in anthropology from the University of Florida. Prior to joining the Office for Institutional Equity and Diversity, Carley received her Juris Doctor from the University of Richmond School of Law in May 2015. During her time as a law student, Carley focused her studies on disability rights law and education law, working with the disability Law Center of Virginia and the University of Richmond’s Education Rights Clinic. In addition, Carley is a certified mediator.